We've already learned about Forming regular adverbs with -ment (feminine adjective + -ment). However, some adverbs have irregular stems, meaning that they differ from the original adjective. And some are just completely irregular. Le bon nageur plonge bien. The good swimmer dives well. C'était une brève rencontre: je l'ai vu brièvement. It was a brief meeting: I saw him briefly. Une moindre personne lirait moins. A lesser person would read less. Le meilleur élève parle mieux français que moi. The best pupil speaks French better than me. Un mauvais vin vieillit mal. A bad wine ages badly. Elle a une petite voix: on l'entend peu. She has a small voice: we don't hear her much. Elle est gentille, et elle parle gentiment. She is kind, and she speaks kindly. I thought "meilleure" meant "best" rather than "better," which is the meaning it's given in the chart. In the sample sentence "Le meilleur élève..." is said to mean "The best pupil..." So again, why in the chart is it said to mean better rather than best, as in the sentence? Thanks in advance. It is because of the article ‘le’ in front of meilleur which makes it ‘best’. How is the gender relevant? 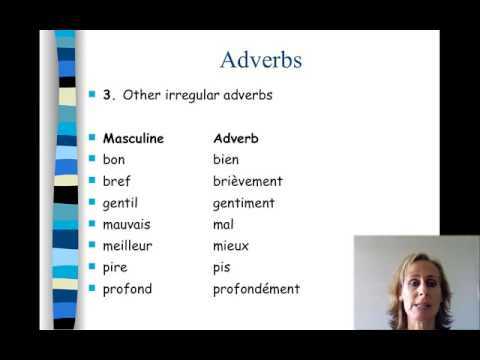 The lesson talks about feminine adjectives, but these adjectives can also be masculine, like bon and gentil. Why does it talk about them as feminine? I agree that it can be a bit confusing, so I've rephrased this intro to remove ambiguity. Thank you for the clarification, Aurélie!